too much cutity for words! Oh how cute! I am a cat person so you had me with the first picture. I didn’t see this until just now. Bonny is so famous. Oh wow oh wow oh wow oh wow. I can’t wait to see what you cook up for the World Vegan Day Birthday Party on the 1st November! What breed of dog is that? It’s adorable! i hit the wrong button to comment on the stout cupcake… my comment is with the pumpkin cinnamon group. it’s so cute! kids will surely love this one! it really yummy i think.!!!!!!!! how lucky the cats!! they able to try the sweet flavor of the cakes…hmmp, me! hi. i’m new at this “blog-world”… i find yours very interesting, and your cupcakes seems to be delicious! would you give me the recepie of this? ps. if u don’t mind, i’ll link your blog on my, who calls ‘it’s alright ma, i’m only cooking”. Funny amazing pics =) Really nice. Those cupcakes look delicious. It would be good to know the recipe that you used. I’m a keen fan of chocolate recipes. 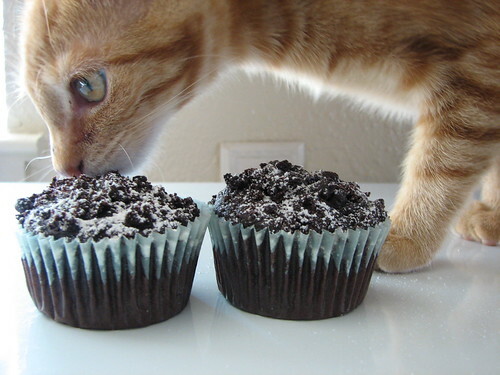 I love cats and I love cupcakes so the first picture caught my attention. Very good photo! And the cupcakes look delicious. I fixed these tasty desserts for snacks. It turned out really great. I will definitely make this again. Thanks for sharing this recipe. Not to be a party pooper, but I really hope that the kitty wasn’t actually eating a chocolate cupcake. Chocolate is highly toxic to animals. While this picture is cute, I fear that it may give folks the wrong impression. The cat picture is great, well done on the photography. Really cool. I wouldn’t want to eat them after that cat had been around them! Have to admit that they look nice. I wanna piece of that ,they look yummy. What a beautiful cat! Delish cupcakes too. It’s a win win! I really like your website, it has unique content, Thank you!